With double-edged blade of gradual taper; inlaid on both sides in gold and silver with decorative patterns, one side bearing a gradually tapering geometric-architectural design in five stages and the other bearing a gradually tapering palmette design. The hilt comprising down-curved cross guard, sturdy tang and five-lobed pommel riveted to the upward-curving upper guard; the cross-guard, upper guard and pommel all inlaid in silver with decorative knotwork and tracery and in gold with dots. This rare Viking sword, the hilt of Petersen Type O, has a cross-guard with decorative devices reminiscent of those on one of the three swords that were found in the rich ship burial of about 900 at Hedeby in Denmark when it was subsequently excavated in the 1950s. More of these ‘rabbit ear’ or ‘knotted rope’ characters may be found on three of the ‘Hiltipreht’ group of swords, namely one in the Wallace Collection, London (Inv. No. A456), the Ballinderry sword in the National Museum of Ireland, Dublin (Inv. No.1928.382) and the example from Malhus in the Trondheim Museum, Norway (Petersen, Abb.89). Swords with sound reputations in battle and other fine qualities would be handed down from father to son and generation to generation. They could be looked upon as having a unique character and personality of their own and many were deemed to possess even magical qualities. The Norse Sagas record notable numbers of swords that were ancient heirlooms, either extracted from burial-mounds of dead warriors for further use or family weapons literally handed down for generations. Swords committed to the ground, sometimes for more than a century, would have required some degree of protection and may well have received a coating of animal fat before being wrapped in sheepskin, where the naturally occurring lanolin would protect against corrosion. In Norse literature, especially in the vast body of Skaldic poetry, swords (as well as byrnies, axes and spears) are given striking and evocative names, called Kennings (meaning the name by which they were known, or “kenned”). Kennings such as: ‘Byrnie-Biter’, ‘'Leg-Biter’, ‘Viper’, ‘War Snake’, ‘Keen’, ‘Long and Sharp’, ‘Serpent of Blood’, ‘Odin’s Flame’, ‘Widow Maker’, ‘Ice of Battle’ are recorded. There were many reasons why a sword was named and therefore regarded as special. 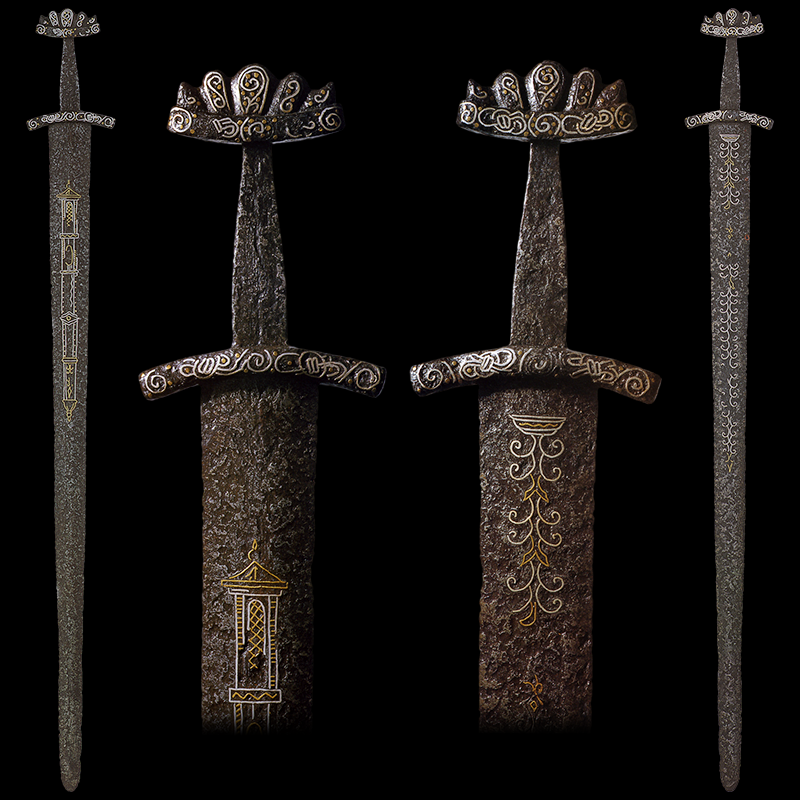 It could be the presence of a decorated hilt or of inlaid devices upon the blade, the excellent balance of the weapon in the hand or simply the sword's reputation as being sturdy, reliable and effective. The quality of our sword coupled with its fine decoration mean that we can be certain that during its active life it possessed these enhancing features and that it would undoubtedly have been named. A sword of very similar form was found in a lake near Sørborg Castle, Denmark and is now preserved in the Nationalmuseet, Copenhagen. See I. Peirce 2002, pp.106-107. A further sword with pommel of ‘cocked hat’ form and inlaid with silver and copper in a closely related style is preserved in the Universitetets Oldsaksamling, Norway, accession C23127, see I. Peirce, op.cit, plate VII. I wonder about the complete authenticity of both the silver-hilted guy with the horn grip, and the triangular decorated 'Finnish' sword with the Celtic Cross. The blade on the Cross sword looks real enough, but I've never seen inlay so close to the edge on such an early sword in Europe (not that I've seen many inlays). There also seems to be something funky about the horn grip itself, but I can't quite put my finger on it... maybe I'm off base here. The majority of these look like fakes to me. I'm in the "not an expert" category but something just looks *off* about a lot of these swords.... The inlay on a few looks like it was done by the same person to me as well. I suppose the people at Bonham's and Peter Finer's know more than me, but some of these look rather amatuerish... And to see so many unique examples of viking swords all gathered together for sale at one time...doesn't this ring some alarm bells? And to see so many unique examples of viking swords all gathered together for sale at one time...doesn't this ring some alarm bells? These were not all in one place or at one time. They were never gathered together as one group. These items have been on the market and changing hands for 10-20 years. The 21 images shown here have references cited ranging from The Metropolitan Museum of Art, The Wallace Collection, The Rothenburg Collection, Bonhams, Peter Finer, Sotheby's, Christie's, Herman HIstorica, etc. 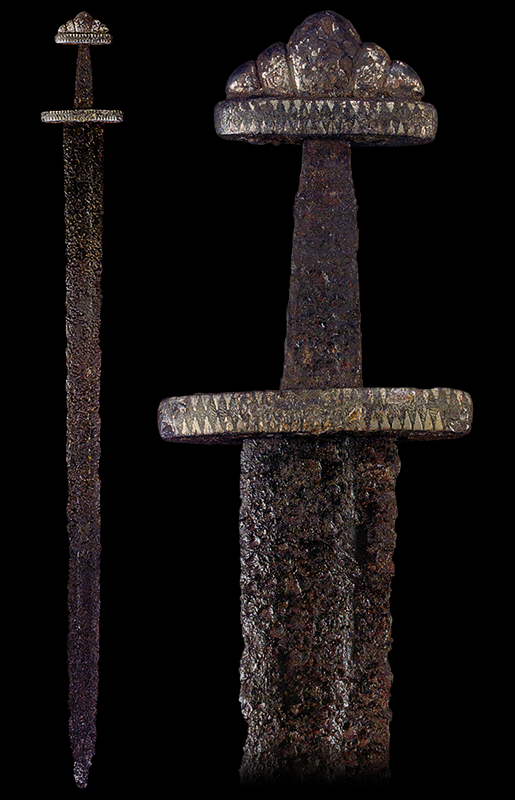 How often do you find evidence of reddish rust on known genuine Viking or medieval swords? My natural feeling is to be suspicious. In this set of swords, #16 is a good example of what I am referring to. One sword that is strongly suspicious to me is the Peter Finer sword #20. The lack of a fuller is highly atypical, and the general appearance of the blade feels off. Also, would you Nathan, or anyone else, be willing to post a new topic on signs of artificial aging, preferably with high quality colour images? I don't know what to look for and I don't recall a forum thread on the subject. I wish I knew the answer to this. It makes me wonder, too. Having said that, however, I remember quite a bit of reddish-brown color at the Wallace Collection. The sword in #8 is quite reddish brown and that has been confirmed by scientific study by Alan Williams as being from the Viking Age period. It's also worth noting that many of these images might not represent the color one would see "in person" as the photography for many of them was just piss-poor. Photographs also tend to bring out artifacts that are otherwise more subtle in person. Your question is a good one and I'd like the answer, too! Really, that's part of the reason that this topic was posted. I made it to start the conversation on the subject. I mentioned that in the original post. I'm not knowledgeable enough about the subject to make a new topic that shows specific dubious examples and specific reasoning for them being questionable. There's been some great discussion on these swords on our Facebook page that discusses such details. I posted this here to encourage the community here to discuss it and perhaps seed a topic like you're suggesting. Of course, people would need ot participate and add content for that to happen. We'll see. So are viking swords, or swords from this era at least, any more or less likely to be fakes than swords from other eras? I guess that more recent swords might have a better provenance, while older swords are more rare altogether. Perhaps there is a sort of confluence of factors that make these swords "fake-able." Too bad, I think some of these are really quite nice, though I have even less of an eye than the esteemed gentlemen speaking in this thread. What are the little holes on either end of the cross on #8? Please note that this topic did not say that the swords here are fakes. There are several shown that are 100% authentic. It said that there are some questions on some of them that I'm inviting others to discuss. There are a lot of fakes for all eras, but math would dictate that the older items have a smaller number of extant samples and are likely to have a larger percentage of non-authentic pieces in the group than later examples. There's a whole flood of "medieval" swords available for sale lately that are simply not real. There's been a ton of katana swords for decades that are not real. There's just as many "bronze age" swords and other items that are very clearly not real out there for sale. It's really a big problem. No idea. Maybe somebody else knows? --Some form of decorative insert or rivet that has since fallen or corroded out. --Rivet holes for old-fashioned golden 'sandwich' layers? Like on a Migration Period sword? --Someone at some museum drilled them to hang the sword up. --(Vaguely serious, probably unrealistic) some form of religious symbol? Nathan - Thank you for posting these. The Wallace Collection Catalogue, Mann/Norman, 1962/1986 has this info in it. It mentions the holes but does not specify what they are. POMMEL, formed of two layers, the upper divided into five lobes, the underside of the lower part is pierced with two holes; short straight QUILLONS, roughly square in section and rounded at the ends; small holes are sunk at either end similar to those under the pommel. The sides of the quillons are matted with fine close-set vertical incisions, possibly for taking a silver overlay. Incised on the forward face of the quillons are the letters HLI: Grip missing. The BLADE is broad, double-edged and has a shallow hollow along the middle on both sides nearly to the point, and bears traces of ornament or of an inscription, down the center. De Beaumont Catalogue, Pl. V; Viollet-le-Duc V, 365; Boeheim 235-6; taking, European Armour II, 14-15, and Fig. 17, Oakeshott Archaeology of Weapons, 1960, pp.136 and 141. This sword is one of a group of five with inscribed quillons, four of which were made the subject of a study by Dr. Adolph Mahr, Ein Wilkingerschwert mit deutschem Namen aus Irland in Mannus: Zeitschrift fur Vorgeschicte. VI. Erganzungband, 1928, pp. 240-52. The other four examples are: (2) in the University Museum at Oslo, from Melhus, Norway, signed HLITER; (3) and (4) in the National Museum of Ireland; one of which comes from the Kilmainham and Islandbrictge excavation and is signed HARTOL FR; the other was found in the crannog in Ballindeny Bog in 1928 and is inscribed HILTPREHT. Dr. Mahr refers to a fourth sword ‘aus Frankreich’ inscribed HLITR, but was unaware that it had long since passed into the Wallace Collection. His knowledge of its existence was derived from Petersen, De Norske Vikingesverd, 1919, pp. 109 -10, who followed Lorange (1889), who in his tum only knew of it from the illustration in Viollet-le-Duc, when it was in the Nieuwerkerke Collection; (5) a fifth sword of this group has been described by F. Morawe in Mannus XI, 1929, pp.292 ff. It is inscribed HIFIIF REHT HILTIP REFIT and was formerly in the Zeugha us at Berlin. The first three letters HLI on one side of the quillon No. A456 am quite distinct the rest of the inscription, which may be as Mahr suggested similar to that on the Oslo sword is not clear. The sword belongs to the type classified by Petersen (op. cit) under Type K, of which he lists thirteen examples, and attributes them to the early 9th century (Laking, European Armour I, pp.14-15, 6Z placed number A456 much too late when he described it as 9th century). Sir Mortimer Wheeler, who refers to this form of sword as Type IV in his London Museum pamphlet London and the I Vikings, 1927 put the date between 850-950 A.D.
Mark, since that 14th century sword is off-topic to this particular topic, I will only comment to say that it was posted on Facebook a couple weeks ago and I've just added your additional information to it. Should you want to discuss this sword or others outside of the Viking Age samples I've put here, go ahead and make a new topic for it. it's a good one.